*A whole chicken can be used or your preference of breast meat/dark meat. As long as the amount of meat is equivalent to a whole chicken. Step 1) Fill two large pots with water, bring to a boil, and add about 2-3 Tbsp of salt to each. In the first pot (Pot #1) add in your chicken (the one to make the stock). Cook for roughly 5-10 minutes, until you can see brown bits floating at the top. This is the blood, you want to cook that out so the stock doesn’t have a “bloody” taste to it. 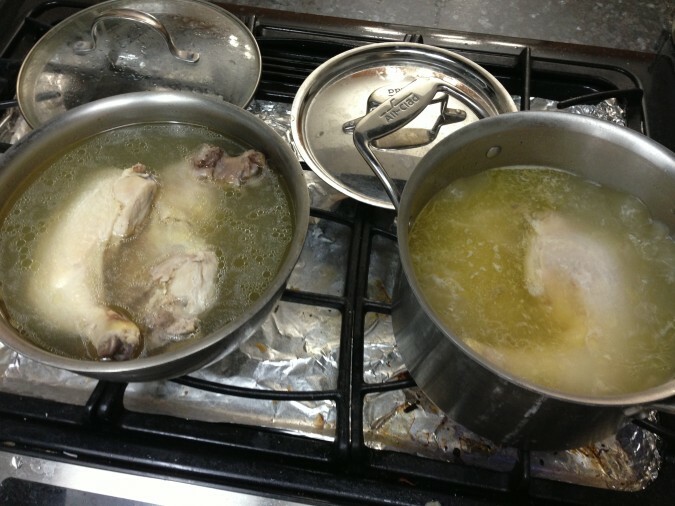 Once you see the brown bits, remove the chicken or chicken bones and place them into the second pot (Pot #2). 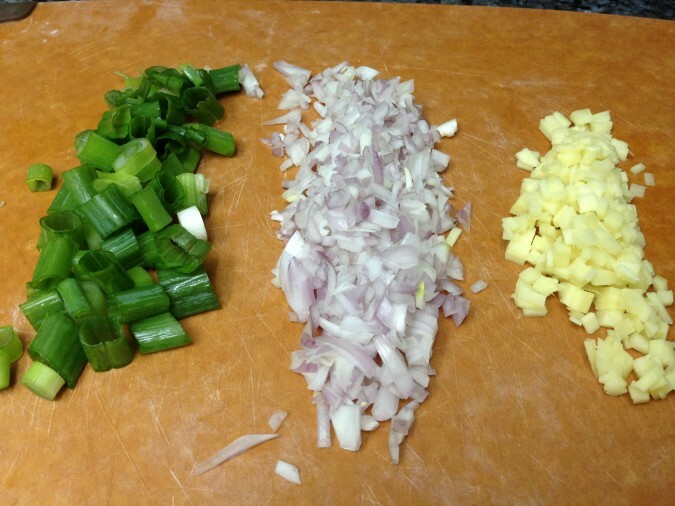 Step 2) Cut up 2 bundles of scallions, 1 ginger root and 2 shallots. 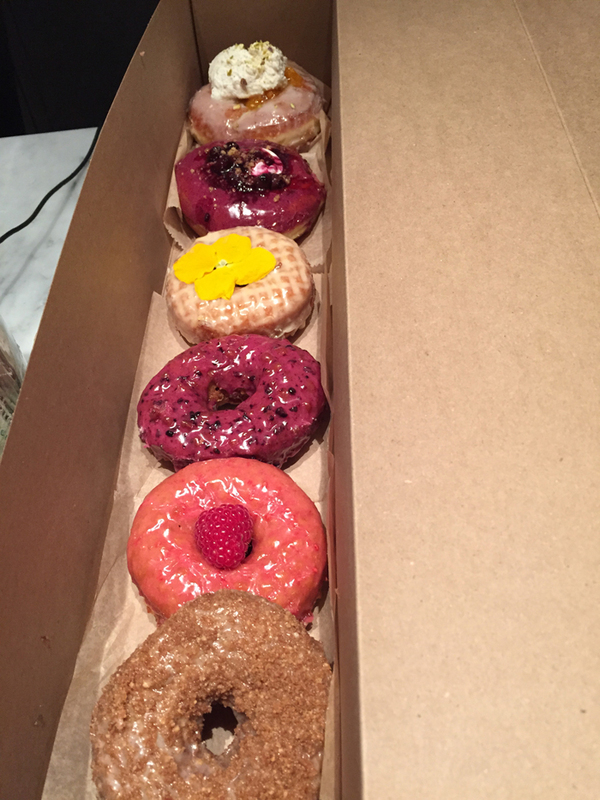 Add these into Pot #2. 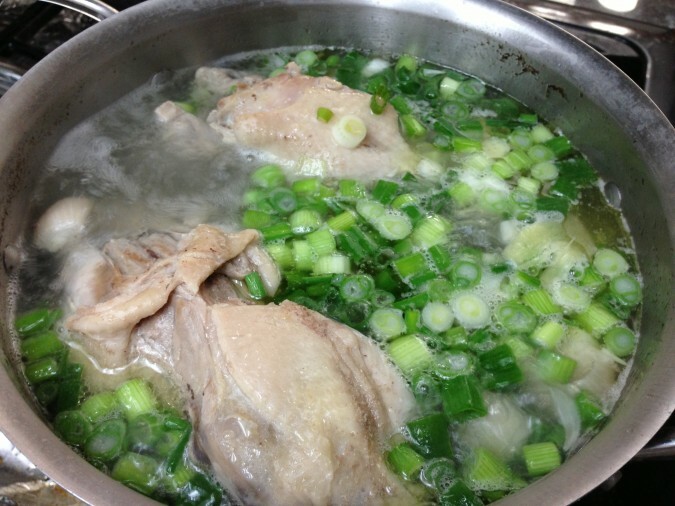 Step 3) Cook the chicken and vegetables for 2-3 hours to create a nice chicken stock. Once the stock is ready, strain the stock and cool it down to room temperature. You can even do this a day in advance and just refrigerate the stock. Just make sure to bring the stock back to room temperature before moving on to step 4. Step 4) Split the stock into two pots. Bring one to a boil and leave the other one at room temperature. In the boiling pot, add in your chicken (the one you are going to use to make Hainan Chicken) and drop the heat to a simmer. (Start Step 5 before continuing) Cook for roughly 30 minutes. I say roughly because you basically want the chicken to be 90% cooked, if you cook it to 100% cooked you will overcook the chicken and it won’t be tender and juicy. Once the chicken is 90% cooked, transfer it from the simmering pot into the room temperature stock. Let the carry over heat cook the chicken to 100%. As the chicken sits in the stock, it will help absorb flavor from the home made stock. Step 5) Take some of the room temperature stock and use it to cook your rice. 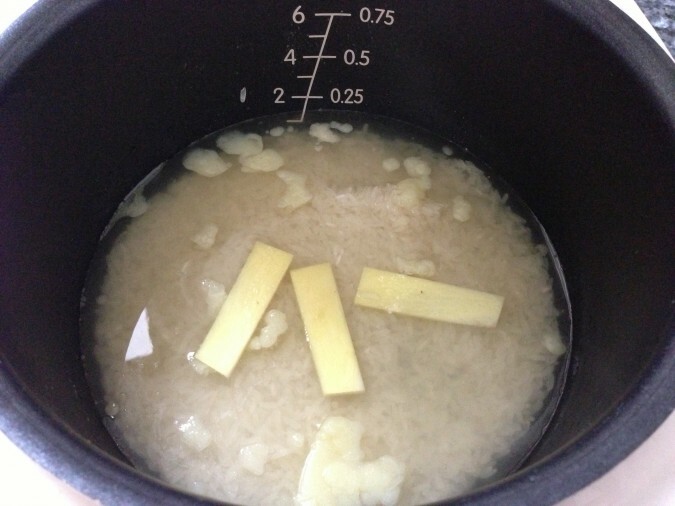 Use your second ginger root and add a few slices of fresh ginger to the rice. Save the rest of the ginger for your sauces. Step 6) Once the rice is done, remove the ginger and stir up the rice. 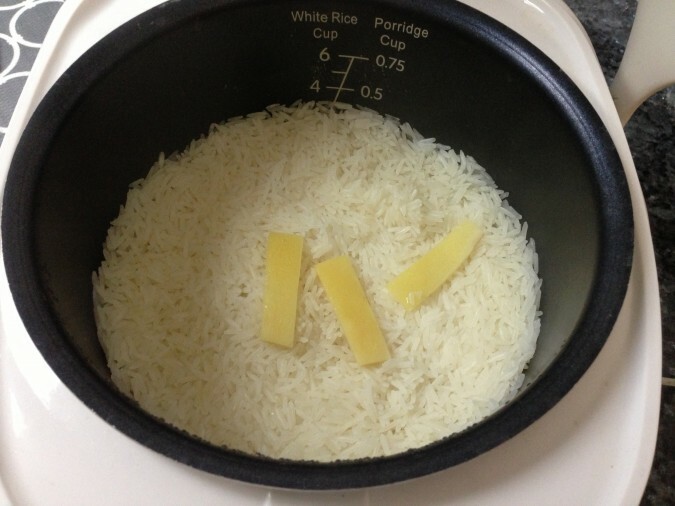 Once stirred, unplug the rice cooker and cover the rice to let it rest. By now, the chicken should be done cooking, so just let it rest in the room temperature stock (this way it will not overcook). Let the chicken sit in the room temperature stock for at least 20 minutes. 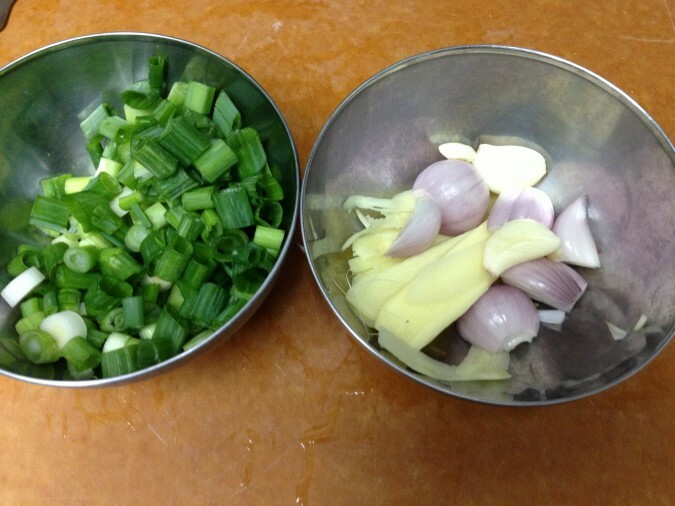 Step 7) Prepare the ginger sauce, mince up the rest of your scallions, shallots, garlic and ginger. 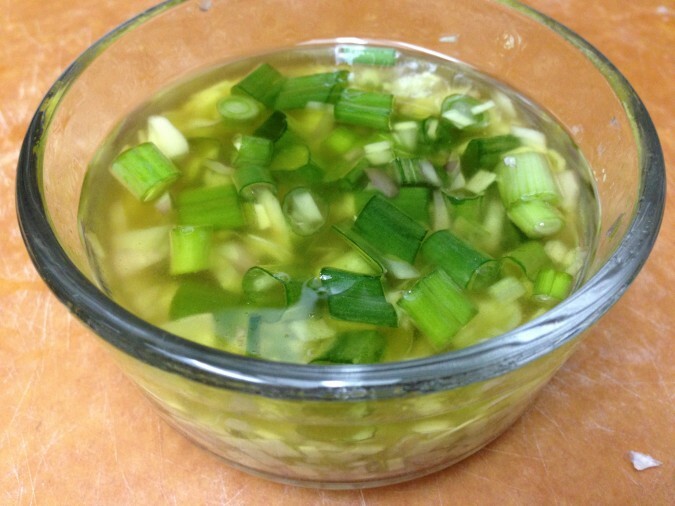 Use a spoon and scoop up some of the chicken fat from the stock and add that into your sauce. Add in the lime juice as well as some sugar and salt to taste. Step 8) My wife and I like spicy food so I decided to make a secondary sauce which is blended. For this sauce you will need the jalapeno, shallots, ginger, lime juice and just a little bit of the chicken fat from the stock. 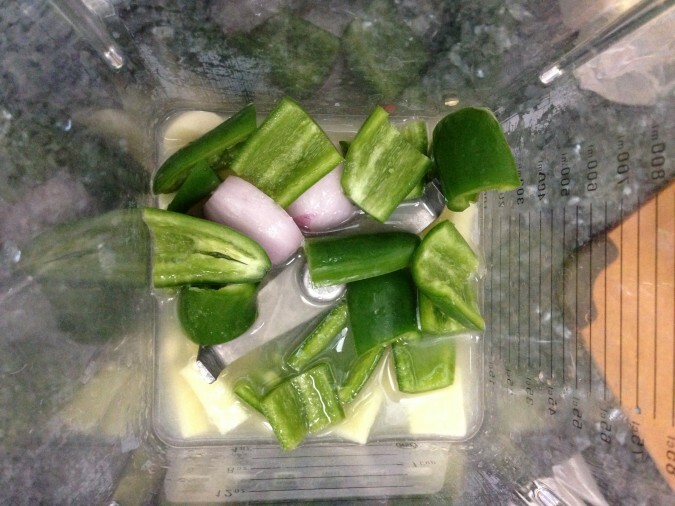 For the jalapeno, I remove the seeds and center white stuff because I want more of the chili pepper flavor and less of the heat. Blend it all up and add in a little salt and sugar to adjust the flavor to your liking. Step 9) Now, remove the chicken from the room temperature stock. 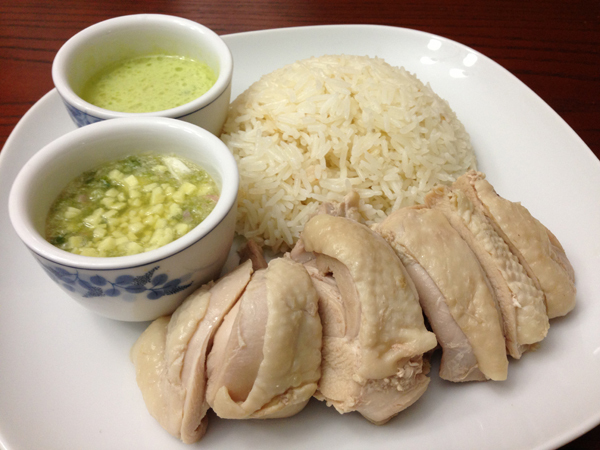 Slice the chicken and serve it with the ginger rice and sauces. You can also serve the chicken with some sweet soy sauce (soy sauce mixed with sugar and water) as well as some sriracha chili sauce (Just blend up some sriracha, lime juice, sugar, salt and some chicken fat). It wasn’t until I actually made Hainan Chicken myself that I realized how much work goes into it. 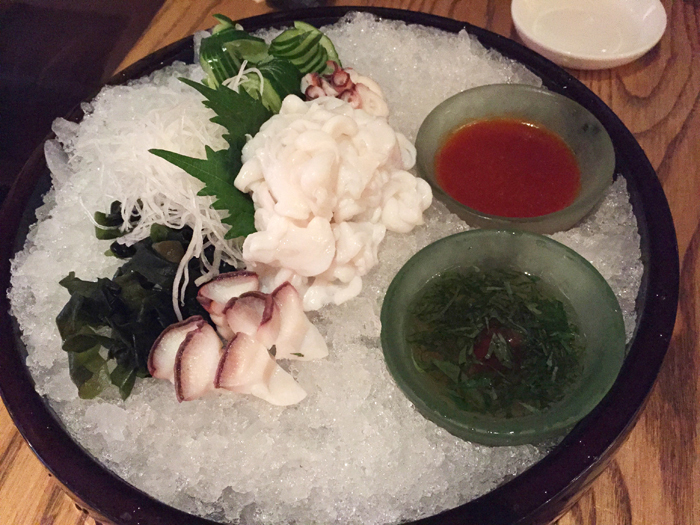 Now I have a huge appreciation for restaurants that perfects this dish on a daily basis.